Chambray is one of my favorite fabrics to work with in the spring/summer. I love pairing it with printed shorts and sandals, but also with white skinnies and heels for a relaxed outfit for a night out. I own both a dark and a light-colored chambray shirt, but I fell head over heels when I saw this dip-dyed version at Anthropologie. It will look super fashion forward with other denim pieces, but I think it’ll jazz up my white jeans look a bit too. It definitely evokes a “cool girl” vibe that I wish I naturally possessed, but you know better than that… I think I need this shirt. Thoughts? Get it here. Give me a denim shirt and I’m a happy girl. Dip dye it and I’m your friend for life. Love it, perfect for the summertime! Ooh! I’d dress it up with a sparkly clutch! 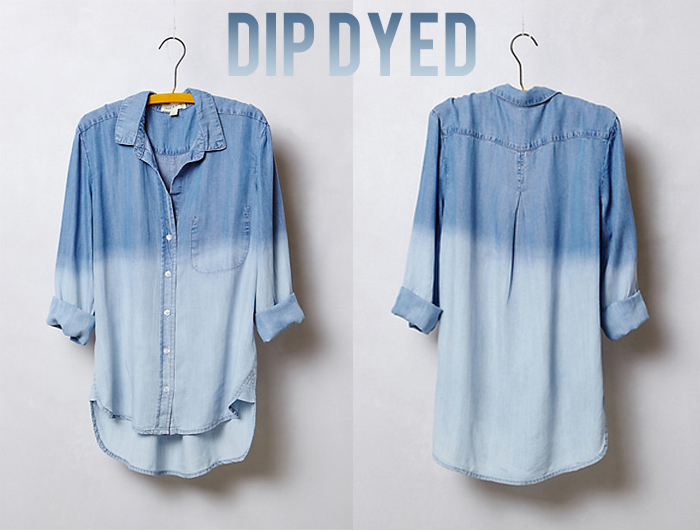 Love this shirt…can easily be paired with white jeans or color jeans! Totally ups the cool factor! I love chambrays that stray slightly from the norm.